Hugh Brown died in November, but The Little City's longest-running business lives on. Brown’s, circa 1890. Mary Riley Styles Public Library, Local History Collection, Falls Church, VA. Walking into Brown’s Hardware in Falls Church feels a bit like entering a portal to the past. The compact space is filled from floor to ceiling with screws, bolts, buckets, hammers, tape, paint—pretty much anything one might need to fix a leaky faucet or refurbish an antique chair. The store doesn’t use computers. Inventory and checkout are still managed the old-fashioned way, by hand. And memory. That’s the way it’s always been, ever since James W. Brown, a schoolteacher, opened what was then a general store near the corner of Broad and Washington streets in 1883. The Civil War had ended nearly two decades earlier, and Falls Church had just become a township. Brown’s soon became a gathering place and acquired the city’s first dedicated telephone line (although, it could only call one place—a doctor’s office down the road). In 1896, the shop was nearly blown to smithereens. The story goes that several hard-up laborers stole dynamite from a nearby bridge construction site, rode to Brown’s on horseback under cover of darkness, broke in and planted eight sticks of dynamite on the safe. “They didn’t know what they were doing,” Hugh Brown, grandson of the store’s founder, said in an interview last fall. “They blew the whole front of the store out but they didn’t get anything. Luckily, no one was killed.” He even had an old, bent coin that was damaged in the explosion. 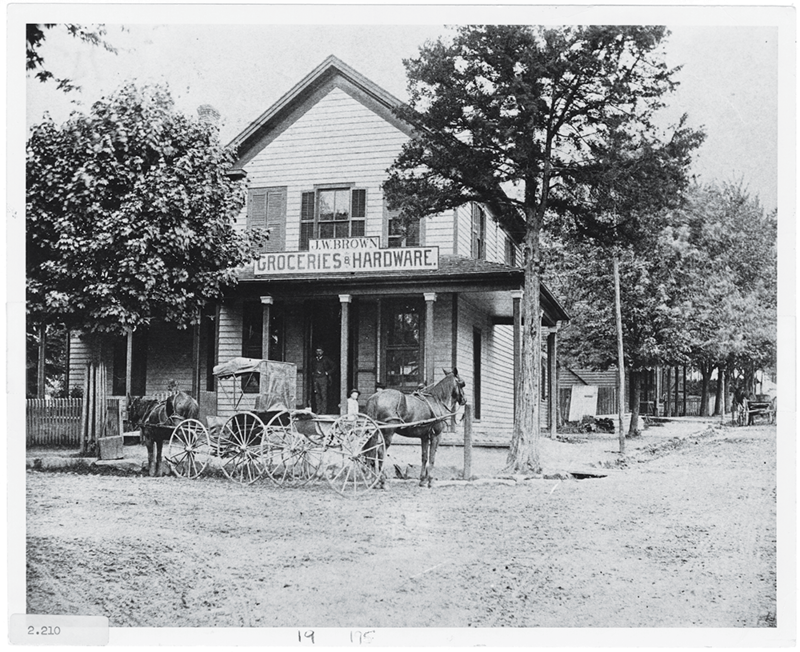 When James W. Brown died in 1904, he left the business to his son, Horace, who, in addition to running the general store, served as vice president of Falls Church Bank across the street. During the Great Depression, Horace offered long-term loans to help local residents get back on their feet. In the mid-1950s, Hugh became a partner in the family business. Together, he and his dad laid plans to expand and reframe Brown’s as exclusively a hardware store (which involved moving the store a few feet back from the road). But then tragedy struck. Horace had a stroke in 1959, just as the father and son were preparing to open the new shop. Over the next six decades, the store thrived. Hugh dutifully carried the mantle right up until his own death this past November at the age of 92. As proprietor, he owned the store and the land on which it sits, including the parking lot, and took pride in its ample inventory of products (including some things he claimed you couldn’t get at Home Depot or Target). He was quick to credit his knowledgeable staff—particularly his “one in a million” general manager John Taylor—with maintaining the values on which the place was founded. For Taylor, the feeling was mutual: “Mr. Brown was the most generous, honest, hard-working guy you’ll ever meet,” he says. Hugh had no surviving family and no children of his own, but he had a succession plan. “When I’m gone, I’ve got it set up so that [John] can keep it going the way it is now,” he said. That’s exactly what’s happened. Taylor is now the official owner, and carrying forth the Brown family tradition.